Background of the drama is set around a private institute for people preparing for their civil service examinations in Noryangjin, Seoul, South Korea. 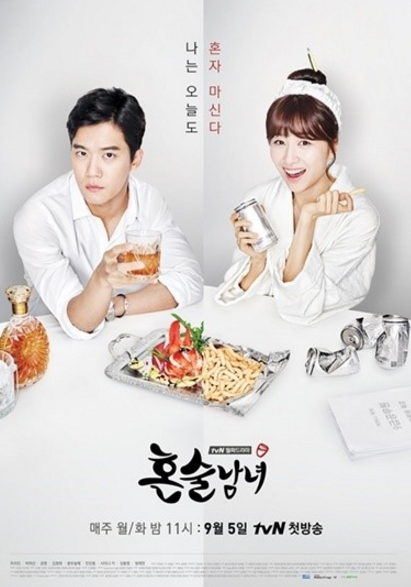 Story depicts people drinking alcohol alone for different reasons and the romance between Jung Suk (Ha Seok Jin) and Shin Ib (Park Ha Sun). Jung Suk is an arrogant, but popular instructor and Shin Ib is a rookie instructor. She struggles to survive in the private institute world. The best thing that happened in this drama is the chemistry between the trio students, that are attending the institute. The way they act really makes me want to be in their circle. Also, oh boy, the way I related to their problems. Being a student is hard these days :'D The main leads problem was the lack of chemistry. This drama had a slow start, but it gets better towards the end. Though, there are some parts i had to skip because it was kind of boring and irrelevant to me. In the beginning the title did concern me, was it only about drinking? or did it have more to it. Well, half of the drama is just repeatings, even if you skip it you won’t miss much. Overall this drama is a good one if you don't focus on the leads love story and the alcohol, but the trio: Lonelyboy, Dumb and dumber.